Introduction (T. Kühme, M. Schneider-Hufschmidt). Part I: Setting the stage. State of the art in adaptive user interfaces (H. Dieterich et al.). Shared knowledge in cooperative problem-solving systems - integrating adaptive and adaptable components (G. Fischer). Experiences from the AID project (D.P. Browne). Spaces and distances: Software architecture and abstraction and their relation to adaptation (G. Cockton). Part II: Modelling users, tasks, and dialogs. User modelling: recent work, prospects and hazards (A. Kobsa). Pragmatic user modelling for adaptive interfaces (J. Kay). Accommodating individual differences through an adaptive user interface (D. Benyon). Intelligent user support based on task models (H.U. Hoppe). A demonstrator based investigation of adaptability (F. Koller). A built-in provision for collecting individual task usage information in UIDE: The user interface design environment (P.N. Sukaviriya, J.D. Foley). Part III: Prototypes and Systems. AIDA - an adaptive system for interactive drafting and CAD applications (J.A. Cote-Muñoz). Adaptive user interface design and its dependence on structure (D.P. Sanderson, S. Treu). Adaptive hypermedia for support systems (G. Grunst). A user-adaptible interface to predict users' needs (E.H. Sherman, E.H. Shortliffe). Part IV: Evaluation. Contributions of a social science based evaluation for adaptive design projects (C. Grüninger, W. van Treeck). Discussion results (U. Malinowski, M. Schneider-Hufschmidt). About the authors. Subject index. discuss possible areas for future research in the field and to define criteria for the selection of the most promising directions of such research. The results of the workshop are presented in this volume. The authors have collected papers from the participants which describe both their research and their views on questions which were dealt with during the workshop. 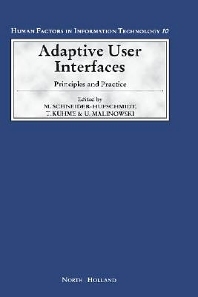 A state-of-the-art report and taxonomy for the field of adaptive interfaces and a discussion summary are also included in this volume.